“Josh was honored to be a Green Beret and he supported his fellow servicemen and women. I know that if he was living, Josh would be doing something to change the suicide rate of veterans in the United States. 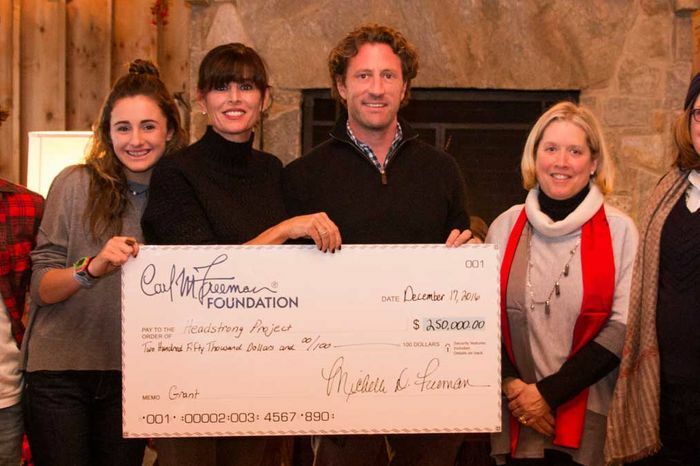 And so, giving this grant feels like the right thing for our family to do to commemorate 10-years of his passing.” said his wife, Michelle Freeman, Chairman and President of the Carl M. Freeman Foundation.Headstrong Project will be available to D.C. veterans as a PTSD treatment option in Spring 2017. “We are looking forward to meeting the urgent needs of D.C. area veterans with the support of the Carl M. Freeman Foundation,” said Zach Iscol, Founder and CEO of Headstrong Project. “Veterans deserve PTSD treatment that is cost and bureaucracy-free with no wait times to receive care.”Joshua Freeman was killed in a helicopter crash in 2006 and was a prominent businessman and philanthropist dedicated to giving back and supporting the communities where his Company employees lived, worked and played. He served four years in the United States Army as a Green Beret in the Special Forces before joining the family development business. Joshua is survived by his wife, Michelle, and their three children.Over the last three years, Headstrong Project has become the one of the top treatment programs for Iraq and Afghanistan veterans suffering from post-traumatic stress, risk for suicide, and substance abuse issues. Funds raised will provide confidential, individually tailored, cost and bureaucracy free treatment for Iraq and Afghanistan veterans suffering from the hidden wounds of war. For more information about Headstrong Project please visit getheadstrong.com. About Headstrong ProjectHeadstrong Project, founded by a combat veteran, provides confidential, individually tailored, cost and bureaucracy free treatment for Iraq and Afghanistan veterans suffering from the hidden wounds of war. In partnership with Weill Cornell Medical College, one of the Nation’s leading mental health care centers, Headstrong Project developed an effective, individually tailored comprehensive treatment program for Post-Traumatic Stress Disorder (PTSD); Addiction Treatment; Anxiety & Depression; Trauma, Grief and Loss; and Anger Management. Headstrong currently serves the New York Metro area, San Diego/Riverside County, Houston and Chicago, with plans to expand to Los Angeles and Washington, D.C.